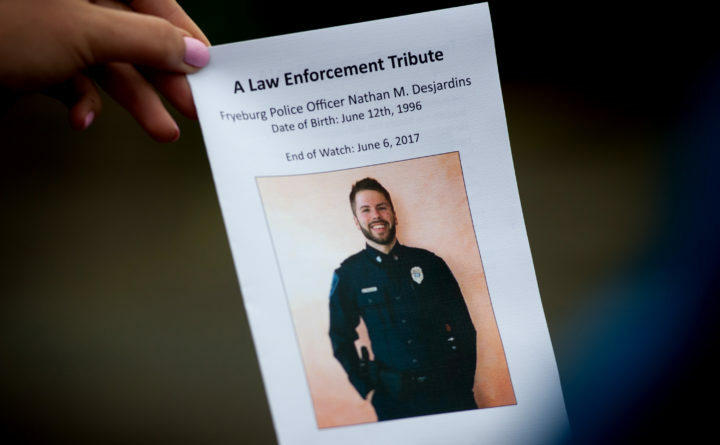 The Law Enforcement Tribute for Fryeburg Police Officer Nathan M. Desjardins was held at the Augusta Civic Center where thousands came to honor the fallen officer, June 16, 2017. The Canal Bridge in Fryeburg will be renamed next weekend in memory of a young police officer who died during a Memorial Day Weekend water rescue effort in 2017. A dedication and renaming ceremony for the Officer Nathan Desjardins Memorial Bridge on Route 5 will take place at 2 p.m. Sunday, Oct. 28, according to Fryeburg Police Chief Joshua Potvin. Desjardins, 20, was on his first day of water rescue training with the Fryeburg Police Department when he and another officer, Dale Stout, were thrown from their boat after it struck a submerged obstacle during a rescue on the Saco River in which three people in two canoes capsized on the water. Desjardins sustained a serious head injury in the accident and died two days later in the hospital. He had been working for the Fryeburg Police Department for about three months at the time of the accident. At his funeral, attended by hundreds of fellow police officers and first responders, the Rev. Kate Braestrup, chaplain for the Maine Warden Service, in her homily said Desjardins had the heart of a hero. “Here was a human being, who having been nurtured in a loving, responsible family, grew up — and stepped up — to become the one who cares for others, protects others and is responsible for others,” she said at the funeral. Route 5 traffic will be detoured and reduced to one lane from 1:30 p.m. to 1:50 p.m. leading up to the ceremony next Sunday and closed during the ceremony, which is expected to last around 30 minutes. There will be a social gathering immediately following the ceremony at the Fryeburg Fire Department.